We have successfully run ghost searches and professional ghost investigations for many years. 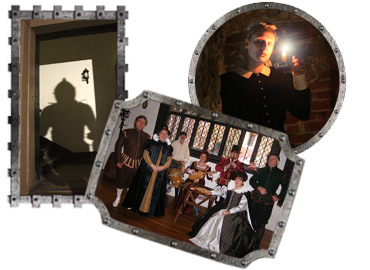 A group of 30 visitors spend the evening with mediums and castle staff investigating paranormal activity. After a ghost walk, small groups conduct vigils in key rooms in the Castle. The teams are given equipment to gauge changes in temperature and activity. No one night is the same and some of the findings are extremely interesting. A regular log will be posted here detailing findings from these nights. The Castle's alarm had gone off and while the museum assistant was waiting for the engineer to come and reset it, she sat in reception. She heard the odd footstep here and there which was nothing unusual, but then the sounds got louder and louder until she could hear the dragging of tables and chairs across the wooden floor... Becoming very uneasy and frightened and sensing that she wasn't wanted in the Castle, Ann dashed outside and straight into the engineer. He was shocked to see her because he had just seen a figure standing in the Ferrers' Room window, which he thought was her! That day, the room had been fitted with a new circular table and chairs, yet on investigation nothing had moved an inch! June was opening up the Tamworth Story Exhibition room one morning when she was struck in the face and momentarily blinded. Afterwards June said it felt like sand had been thrown at her. When she cleared her eyes, she saw a blue mist swirl around the room near a display of 19th century ceramics and disappear out of the window. The mist was at least six feet high. Legend has it that the 'Black Lady' haunts this room. She was a 9th century nun called Editha who was expelled from Polesworth Abbey by the first Baron Marmion. The continued prayers of her homeless nuns eventually called her from her grave and one night in 1139, after a lavish banquet, the 3rd Baron Marmion saw a vision of her while in his bedchamber. She prophesied that unless the nuns were restored to Polesworth, he would meet an untimely and painful death. Just before she vanished she struck him on his side with the point of her crosier and the wound was so terrible that the whole castle was awoken by his cries. Seeing him so tormented with pain his friends advised him to confess himself to a priest and restore the nuns to the Abbey. His pain only ceased when this vow was taken and the nuns were allowed to return. Please email in your own paranormal experiences at Tamworth Castle and we will post them on this page. We can make no guarantees about the validity or likelihood of information obtained from Tamworth Borough Council employees, contractors, psychics, mediums and clairvoyants on any of our ghost search events or anecdotal information detailed here. Pay us a visit and find out for yourself!